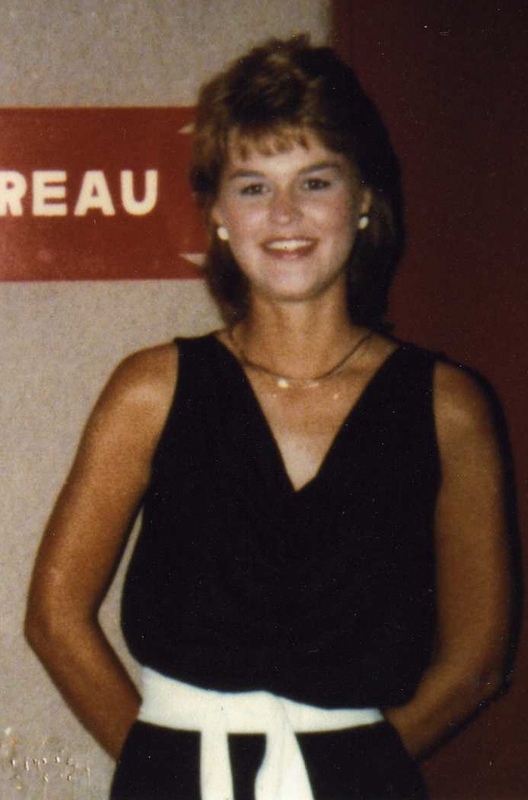 Sherri Rae Rasmussen, 1980's, murdered by Stephanie Lazarus. 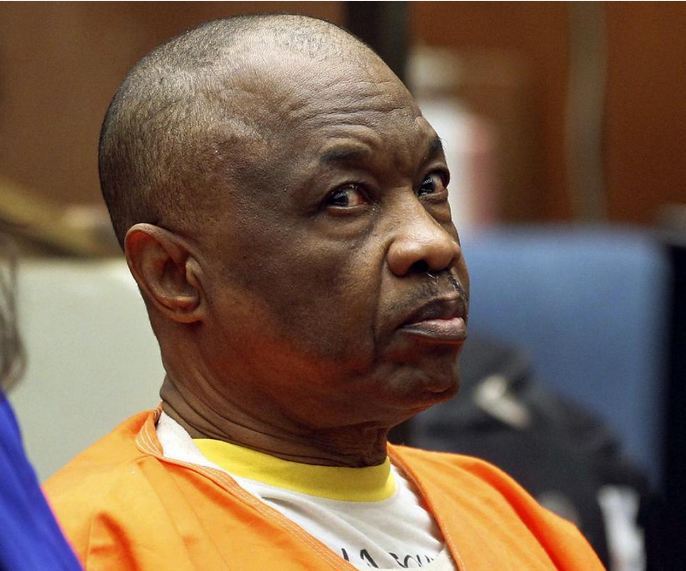 The California Supreme Court refused Wednesday to hear the case against a former Los Angeles police detective who was convicted of gunning down her ex-lover’s new wife in 1986 at the condominium where the couple lived in Van Nuys. Lazarus' was convicted of first degree murder in the death of Sherri Rae Rasmussen on March 8, 2012. She was sentenced to 27 years to life. Lazarus' next step would be a habeus corpus appeal. Full Daily News article HERE. Below is a status update on all 15 defendants in the two indictments. On October 17 around 7:45 am, David Johnson, the 80 year old defendant with stage 4 bladder cancer, was released from custody on his own recognizance. I did not attend the hearing regarding Johnson's release but I would not be surprised if it was a compassionate release by the court. I will update if I am able to get more information. LA County Sheriff's website indicates defendant Jeff Stevens had a hearing today. Stevens originally was the first defendant to have a bail hearing on September 25, when his bail was reduced from $18.5 million to 10 million. However, checking the Sheriff's website, it indicates Stevens is now listed as "no bail," meaning, for some reason he lost bail. Stevens' next hearing date is October 28. The next hearing date for the remaining defendants in and out of custody is November 3. *Unknown if this is still his bail. I'm on the 9th floor of the downtown Criminal Justice Center. There are not as many people here like there were on September 25. Kelly Soo Park's husband and sister Kim are here, along with friend Deborah van Cleeve. Defendant Paul Turley's attorney Benjamin Gluck is here along with Reuven Cohen, one of the attorneys representing Marisa Schermbeck-Nelson. I also see journalist Pat LaLama's husband, attorney Tony Brooklier has arrived. He's representing defendant Leticia Lemus, who is #7 on the larger indictment. I've always liked Tony. He's tall and distinguished looking and has always been kind to me. At this end of the hallway, there are a few people with juror badges sitting on benches. The attorneys are congregating in several groups. Like I've noticed before, Mr. Gluck appears to be the attorney that other counsel are conferring with the most. It makes sense, once you understand that Mr. Gluck has represented Dr. Uwaydah for many years. Benjamin Gluck is no stranger to representing medical professionals charged with insurance billing fraud. He has two criminal cases in Orange County that are still pending. While currently representing Paul Turley in this case, back in 2011, Gluck was representing Dr. Uwaydah/Frontline Medical. Frontline had made a $100,000 deposit towards Park's defense on first degree murder charges. Alerted by the prosecution to a potential conflict of interest because of the source of these funds, Park's attorneys withdrew their representation of Park. The question then became, who had authority over the funds that were sitting in Park's former counsel's trust account. I missed that hearing, but Lonce LaMon from adjuster.com reported on what she called the "tug of war" over the $100,000.00. Not much earlier in time, Mr. Gluck represented Dr. Uwaydah/ Frontline in suing two of his current co-defendants, Peter Nelson and Marisa Schermbeck [later Schermbeck-Nelson]. It was in November 2010, almost three weeks after Park bonded out of jail, and five months after Uwaydah fled the country. Dr. Uwaydah had Gluck file a lawsuit charging the pair with breach of fiduciary duty, constructive fraud, conversion, civil theft, unjust enrichment and unfair business act or practice. You can read the initial filing HERE. The lawsuit was eventually dismissed because Dr. Uwaydah claimed he could not return to the United States to be deposed. More people arrive on the 9th floor. I thought the LA Times might show up but they haven't arrived yet. There are a couple of ladies walking the hallway back and forth. The 9th floor is very busy with trials today. 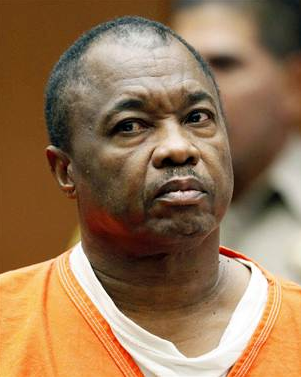 Ka Pasasouk, charged with the December 2012, quadruple murder in a Northridge illegal boarding house, his trial recently started jury selection in Dept. 106, Judge Fidler's court. Judge Fidler presided over both Phil Spector trials. In Dept. 107 Judge Lomeli's court, a jury is hearing closing arguments in the trial of Dr. Lisa Tseng, on trial for murder in the deaths of three of her patients. The prosecution alleges Dr. Tseng was a "pill doctor" and her over-prescribing of pain killers caused her patients deaths. Over in Dept. 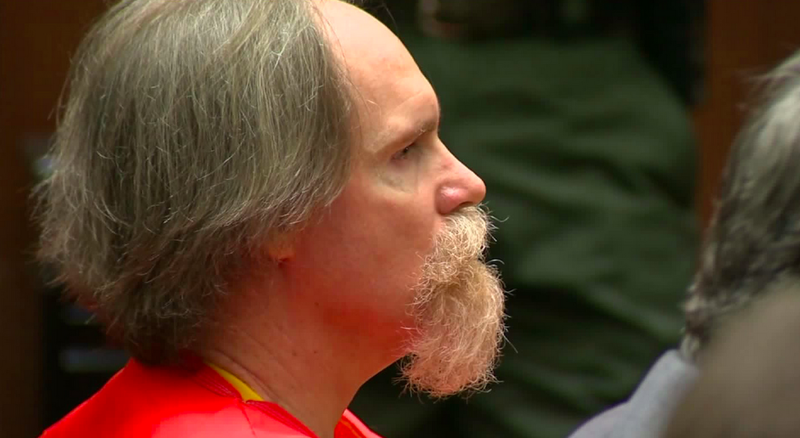 104 (Judge Perry's court, who presided over the Stephanie Lazarus trial) opening statements are starting in the trial of Scott Kratlian, who is charged with murdering a pen pal. The introductions and hand shaking continues between various defense counsel. DDA Dayan Mathai arrives. He heads over to a group of defense attorneys that includes Mr. Gluck. There are introductions and smiles exchanged. Right behind DDA Mathai, journalist Lonce LaMon clears the security station. A deputy orders all attorneys to sit in the jury box. He then orders all defendants out of custody to sit in the front row, left side, right next to the bailiff's box. Two very pretty female defendants are there. The much younger woman on the right is Yolanda Groscost. Her hair, makeup and outfit are perfect. Groscost could have just walked off a modeling shoot. The older, professionally polished woman on the left is attorney Tatiana Arnold. The male defendant out on bond, Terry Luke, is not here yet. A very casually dressed man sitting to my right, leans in to tell me he thinks the two women in the front row have had plastic surgery. The courtroom is a little over half full. There are five deputies in the room to keep order. Again, the one deputy orders all defense attorneys in the jury box. A few attorneys stop by the regular bailiff's desk. They are trying to see their clients. Judge Kennedy comes out and speaks to her bailiff. She is not in her robe yet. DDA Mathai exits the courtroom to have a conversation with several people in the ante chamber. The regular bailiff goes out to speak to DDA Mathai in the ante chamber. Terry Luke arrives and he's ordered to sit in the first row with the other defendants out on bond. A blond female attorney comes over to the bonded defendants and introduces herself as "Nina." I miss her last name. I hear in the well that another attorney will be standing in for Louis Shapiro, Peter Nelson's counsel. Jane Robison from the DA's office is here. Benjamin Gluck takes the lead to communicate for the group to the court. Judge Kennedy's clerk tells the parties that the judge is coming out. He adds, "She is going to check in with everyone." Judge Kennedy takes the bench and goes on the record. "This is the people against [she pauses], everybody." There's a bit of laughter in the courtroom with her description. "We are on calendar for a sort of pretrial today, and I know that um, the defendant from yesterday we do not have." Ms. Touchhan, who represents David Johnson, tells the court her client is still out on a medical problem. The court asks the bailiff, "Is everyone else here now?" Her bailiff responds, "We’re still missing Paul Turley." Turley is still in transit from the jail to the court. The court continues, "There are a couple of defendants that have two attorneys. ...it makes things confusing for the court. ..and Amy Jacks, where are you? ... What is your status?" Ms. Jacks, one of the counsel representing Marisa Schermbeck-Nelson, responds. "Our status is that we have not been properly [paid?]." I believe there is also some discussion involving Mr. Flemming, [co-counsel for Jeff Stevens] and that he has not been retained. Judge Kennedy's clerk reads something to her, then she addresses the group. "I'm not sure what everyone wants to do today. ... Ms. Jacks, you have a motion, a bail motion, and we'll get to that I guess. ... What does everyone else want to do?" DDA Mathai addresses the court. He states that there is Ms. Jacks bail motion and there are some issues regarding the protective order that will be quick that we can resolve. There are some issues regarding discovery and the matter of picking a new date. The court mentions that there is something that the people filed yesterday, but the court is not aware if the defense attorneys have received it yet. I believe DDA Mathai states they emailed the defense attorneys the motion they filed. The parties are trying to pick dates. The defense needs to tell the court about their readiness. Benjamin Gluck for defendant Turley addresses the court regarding the readiness. "On that point we have a few housekeeping items to solve. Unfortunately, our best laid plans from last time did not come to fruition. ... We did not get the grand jury instructions or exhibits until last night. ... the point is we set that date [under the belief?] we would have that and [more discovery?]. ... At the same time we've been trying to get some [list of?] items of what discovery is going to look like. ... We've been unable to get some predictions on that from from the DA's office. ... We've gotten some discovery. It appears to be a very narrow slice of the issues. ... We would be happy with an index of what we might.... even a non binding index, so we can sit down with our clients and say what we have to work with, and not come in every week. ... We don't have anything really to set yet. I would propose we could set a date, even without defendant's here." Judge Kennedy tells the parties, "What I understand, the defendants are 30 of zero today. As long as we don't go beyond the 60, we don't need defendants here to waive time. Mr. Gluck states, "We could set a date in the near future." The defense requests the court requests the people give some indication of what and when [the next set of discovery] is going to come in and then they could pick a realistic schedule to handle the case. "We just don't have enough information to even guess at it. ... Then we set a date in the near future ... and then tell the court what type of motion we expect to be bringing." DDA Mathai responds. "I think in the issue of discovery ... I can appreciate the reason that counsel wants some clarity on it. The problem is we've ... It's hard to give that clarity. ... I sent an email last night ... what we've turned over and tried to be as specific as we can without locking ourselves into [anything]. ... We have given counsel, plus grand jury, 15,000 pages. ... We've outlined it for defense counsel. ... I don't know what other type of index [they] want but the categories are ..."
Judge Kennedy clarifies, "You've summarized what's been given ... but I guess what [they] want is an index of what you will give." DDA Mathai continues. "What we turned over, ... we've turned over on hard drive. Phase two includes audio and video recordings, 188 of them." DDA Mathai adds that there are specific instructions on getting these all at once to all the defense counsel. Defense counsel has to go all together and make a payment for copies of all those recordings. "We have outlined that ... in two weeks they will have a majority of the case. ... We've tried to prioritize, and it's so tedious to copy all of it and scan and date stamp it. ... That process is going on behind the scenes every day. ... And as we get it, we've tried to forecast it for the defense. ... We're a month into the arraignment. ... Within six weeks [they] will have a bulk of the discovery. ... All the recordings and DA investigation reports, the California Medical Board reports. ... So I've outlined all that for counsel. ... After phase two there will be additional discovery and we won't know [the exact?] time frame on that. ... [it's] stuff that's been recovered on search warrants that needs to go through discovery." DDA Mathai tells the court they've tried their best and that they've tried to have some clarity on that [roll out of what's coming] themselves, but that's why they don't have certainty on some of the items. The majority of the discovery, the defense will have within six weeks of arraignment. Mr. Gluck replies, "That's incredibly helpful information, and that was what Ms. Chon refused to give us and if she would only ... I have to point out that the indictment was filed in February. ... It was filed and on the bail amount that ... so that it is not a surprise that people are in custody. ... So why would it take six months to get discovery to us? The things that Mr. Mathai is saying are very helpful. ... If we can keep them to that it will solve many of the things we are demanding." Mr. Gluck then addresses the issue with the recordings. "They are demanding $60,000, or $5,000 per defendant in order to make available to us that we are entitled to have under the constitution. ... We think that's excessive and unnecessary. ... We think a copy service to copy transcripts under the law ... that we should have to give $60,000 to the audio lab ... there [must be] a faster and cheaper way to do that." DDA Mathai responds, "Everything that I have said, is reflected in the email, their cost associated with that is what we've been informed of. ... The sound lab gave us this amount." This is not something that is arbitrary. This is what the DA's have been told from the sound lab. Judge Kennedy replies, There may have to be some kind of motion in regard to that. ... It seem unfair, that you have to pay to get discovery on your own case." There is more discussion about the sound lab's costs. Judge Kennedy adds, "It doesn't seem right. With out looking into it, it doesn't sound right to me." DDA Chon adds something to the effect of, when counsel is appointed, these are [court?] rules and are discoverable. When they don't have funds, all that is free. DDA Chon explains more to the court but it is totally incomprehensible to me. Judge Kennedy adds, "You'd want to look into that. It may be a litigation issue at this point, I don't know." Mr. Gluck adds, "To save time, if we could have a stipulation that they make a collection ... I will copy it. Even I can copy those files on my computer and I can share with them [the rest of defense counsel]." Mr. Gluck adds something about a process from the sound lab might take months. Judge Kennedy states Gluck's suggestion seems reasonable. The proposition is, the prosecution makes one copy. The defense takes up a collection collectively. As a group, they pay for one copy and all the defendants sign that they are not going to demand a separate copy [from the prosecution], the defense gets some kind of [receipt?]. That seems like a much more expeditious process. DDA Chon states, they can do that, and that she sent in the email what they have to do. Mr. Gluck makes it official. They are now agreeing that Mr. Gluck's office will copy one hard drive and one payment and will share with the other defendants that participate. DDA Chon adds, the defendants, they all must agree in open court and it must be on the record. Judge Kennedy adds, "If any of the individual attorneys wish to pay their own $5,000 and get their own copy, and are free to do so, but they can opt out on the record as the ones remaining can do." DDA Chon replies, "It must be on the record." DDA Mathai tells the court [about the costs], "This is not our idea. This is from the professionals that do that." Mr. Gluck insists this is not because of the defense. There is more discussion about making this clear as to who is opting into Mr. Gluck's proposal and who would be opting out and who would be chipping into the fund. There is discussion about getting the waivers now instead of coming back. They will have to work fast, because the looming item is the scheduled evacuation drill of the building. Judge Kennedy, on the record calls it, "Because of the shake out. We have a shake down and shake out." Judge Kennedy tells the group, "We have certain defendants that are here. ... There was something about a protective order?" DDA Mathai responds to the court's inquiry. Mr. Gluck sent a proposed amendment to the protective order. The only change we are recommending to Mr. Gluck's proposal is that it reflects that all parties are bound by it. The DDA is asking for the protective order. The defense parties are not. Mr. Gluck states that he is agreeable to that. He wants to point out that there's been material that's been released publicly. And this is when Judge Kennedy makes an announcement. Judge Kennedy replies, "I'm going to fess up to an error that I made. I allowed [two] reporters to read some of the grand jury transcripts, not realizing, that ... [not] all of the defense attorneys got their transcripts. ... I assumed that everyone had them until all these issues came up. ... [There is] supposed to be a ten day grace period when defense counsel gets transcripts ... then open to the public. So that's my fault. I own that. I won't make that mistake again. .... That's my error. It's not on the defense." Mr. Gluck replies, "That was one of the things that I would say. That information did not come from us [defense counsel]. ... [There was] medical information with names redacted on the net and that didn't come from us." DDA Mathai states they can write up the amendment and submit it to the court. So, the parties are going to amend the protective order. Judge Kennedy replies, "If you can interlineate it in a way that is agreeable to both sides, that's fine with me." Counsel are trying to figure out how they can do this quickly without having to go back to office to have something typed officially. A suggestion is made to just hand-write it in. I'm not sure who, but someone says, "I have bad handwriting." DDA Kennes Ma addresses the court. It has something to do with the temporary restraining order. He also brings up the issue that there are people that have claims against [the seized funds?]. Judge Kennedy states there are claims that have been filed already. There are others that are considered verified claimants. Mr. Gluck tells the court that he spoke to Mr. Ma. "The statutes are unclear if the defendants need to put in claims." Judge Kennedy clarifies, "So in the interest, the defendants are going to file claims." DDA Ma asks that the TRO [temporary restraining order] be in effect. Gluck has one more issue to bring up and that's regarding the grand jury procedure whether the exhibits are maintained and when instructions are shredded, and what policy governs that. Judge Kennedy states she doesn't know if that's a court policy or a DA policy. DDA Mathai adds that there are some things that the DA's don't control in the grand jury. Defense counsel will have to find out from the grand jury from their procedures. Judge Kennedy states that Dept. 100 is the one that would know these things. [Department 100 is the court's master calendar court.] Judge Kennedy tells counsel, "I will ask Judge Brandlin. He would know these things." Mr. Gluck is asking about the grand jury adviser. The grand jury adviser is a deputy district attorney. Judge Kennedy responds, "Mr. Mathai, you can look into that." The court continues, "Now we need to pick dates. And if we’re going to take waivers we need to rotate attorneys and have five male defendants and the three out of custody. ... Have you all discussed dates?" Mr. Moss [representing defendant Jeff Stevens] stands. He speaks so softly the court tells him she can't hear him. Mr. Moss asks for next Tuesday for his client. Mathai agrees to next Tuesday. DDA Mathati wants to add "one small thing." On October 9, people filed an updated temporary restraining order against the bank accounts. They only involve 9 mentioned names. "I have those to be picked up. This order has been published in the Daily Journal and sent out to last known addresses." Mr. Gluck brings up another issue that I miss. A female attorney, I believe it's the Deputy AG Elyse Davidson, is asking for a notice if bail status changes for this defendant [Paul Turley]. Judge Kennedy states, "Assuming the attorney general is on the mailing list or notice list." Mr. Gluck tells the court, "We can certainly add the attorney general for any mailings." Ms. Davidson tells the court, "Our main concern is the public protection." Five male defendants are brought out. They are all chained together, in a row. The defendants are sitting at the defense table. Their counsel are standing behind them. Judge Kennedy tells counsel, "There has to be an explanation to them about this waiver on the discovery or whatever. On the far left is Paul Turley. I recognize Ron Case on the far right. Mr. Turley is called first. Mr. Gluck for Mr. Turley. Judge Kennedy addresses the parties. "Just so that all defendants understand. We had an informal discussion. The discovery is voluminous. The DA's office states they want $5,000 from each privately represented defendant in order to receive the next state of discovery. ... What has been proposed ... rather than each private represented defendant, paying for their own discovery with the DA's, ... that Mr. Gluck, on behalf of all the defendants is going to pay and hopefully get contribution from co-counsel for one copy of the discovery, and he is there after going to duplicate the discovery at [a cost of] something less than $5,000 per defendant." I believe it's DDA Chon who speaks next. For the record, what we want to do is to have the individual defendant agree and their attorney agree, one, Mr. Gluck received his copy directly [from the DA's office]. ... That discovery is your discovery as well and you're going to accept that copy that he provided and not come back that you need your own, individual copy from the prosecutor. I'm not sure if it's the court who continues or if DDA Chon adds the next piece. Anybody can if they want to, pay the $4,716.04 to get their own copy. But if you go this way, and agree to go through this procedure, then you cannot claim later that somehow, the discovery has been denied to you. Mr. Turley has no objection. Next is Peter Nelson. Amy Jacks, special appearance for Peter Nelson. Nelson agrees. Jeff Stevens is next. Mr. Richard Moss for Stevens. They are agreeable. Ron case is next. I miss the name of the female attorney who speaks up. In addition, there is also a public defender who is representing Mr. Case. The public defender will get their own copy of discovery. [That's because, defendants who cannot afford an attorney, and one is provided by the state/county, they do not have to pay the DA's office for the audio/video files.] Judge Kennedy adds, "In the case that there is a private counsel that represents you, that attorney will be responsible for getting a copy of the discovery." Counsel join on Ron Case. Judge Kennedy asks for the attorney for Mr. Folgar. Mr. Werksman, who supposedly is representing him, is not here. Ms. Jacks speaks up and asks about Mr. Shapiro's client, Peter Nelson. 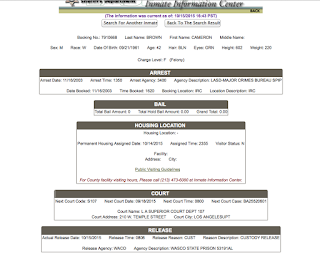 Apparently, Nelson had a bail hearing scheduled of October 23. That's a bad date for the court so it needs to be changed. Ms. Jacks states she will have Mr. Shapiro contact the court. I'm not sure who it is who steps up for Mr. Werksman and defendant Folgar. They tell the court that there were some issues with the retainer. Judge Kennedy states she was not under that impression. The counsel who is there for Werksman states there is a problem with the representation fee. The next issue, is to set a date for about a week and a half, so counsel can tell the court the defense plan regarding the 995 filing. DDA Chon addresses the court about some of the problems with the case. The next defendants that are addressed are those out on bond. First is Terry Luke. A new defense attorney is here for Luke. It is not Jeff Kent. All I have is "Marina" or Ms. Marina. Luke's new counsel has not received any discovery. She may have received the TRO's and something about the "claims." Judge Kennedy asks the defendant if he's heard about obtaining the discovery. Luke agrees to the suggested method of obtaining the additional discovery. Mr. Gluck suggest splitting the two indictments onto two different calendar tracks. Judge Kennedy responds, "At this point, I want to keep everyone on this one calendar." Joel Levy for Ms. Groscost. They will participate in the discovery in the manner discussed today. Ms. Groscost agrees from the gallery. Mr. Levy tells the court his client would like to waive time to a status of November 19. The other people on the smaller indictment, BA435339, were hoping to split out [onto a different calendar track]. Mr. Levy believes that the discovery issues will not be resolved by the Nov. 19 date, so his client would like to waive time. Next is Tatiana Arnold. Her attorney has an issue. Her attorney is not available, and ask that every hearing be set collectively. Now the calendar date they are looking at is November 2. The court states a better date would be November 3. "Does that work for everyone?," the court asks. Mr. Gluck responds, "Yes, your honor." Mr. Levy for Ms. Groscost again. "My client is out of custody. She had a long planned trip, was going to take a trip to North Carolina." DDA Mathai speaks to Mr. Levy privately, off the record. The court asks, "Have we finished with these five in custody defendants?" The court then adds, "Now set for October 20 for opposition on the [186?] for defendant Stevens, and November 3 for everyone else." Mr. Gluck asks, "Would it be permissible for the people to give us their index, not binding, but in advance of that?" Judge Kennedy states, "If you need my permission for that you have it. ... In the extent you need to work these [things] out among yourself, it's always better." DDA Chon speaks next, but since she's seated, I can't see her and have difficulty hearing her. I believe the court states that David Johnson, at this point would be November 3. DDA Chon adds that regarding [the first set of discovery?] for all defendants, they could submit their hard drives. Judge Kennedy adds, the charges are only for audio and video. [Not the rest of discovery.] DDA Chon states she still needs hard drives from defense attorneys to turn over the rest of discovery. Judge Kennedy asks if everyone understands that. She then asks for the next group of defendants. Ms. Arnold's attorney tells the court they have another issue in regard with respect to Ms. Arnold. [They] have not been provided the search warrant and the special master and numerous files related to this matter were apparently seized during the search warrants. The matter issued via the indictment. DDA Mathai states this is the first time Arnold's attorney has brought this matter up to him. He also states that he's informed [counsel as a group, or Ms. Arnold counsel?] that they are hoping that the search warrants that were from the arrest date of Ms. Arnold's arrest will be included in this case in the next two weeks. There is a question about why there is no special master for Ms. Arnold's files. DDA Mathai states he will discuss that with [counsel?] later. I believe it's Mr. Gluck who tells the court that Ms. Arnold also represented completely unrelated clients to this case, so that is an issue that has been flagged for the DDA. Ms. Arnold had an independent law practice, but what Mr. Gluck can't confirm is there were reams of files of clients in her practice, completely unrelated to this matter. Mr. Gluck is asking that those files be returned as quickly as possible. DDA Mathai will take this matter up with Ms. Garafalo after court today. Judge Kennedy asks, "You all are going to talk after court, I'm assuming. On November 3, if you haven't resolved [this] you can take it up then." DDA Kennes Ma has housekeeping issues. People filed a temporary restraining order 186, under seal. It was under [the] indictment. At this time, the people no longer need that seal." A female defendant in custody is brought out. Maria Turley. Vicki Podberesky for Maria Turley. Maria's waiver for Gulck to get the discovery is obtained. Next hearing date for her is November 3. DDA Chon clarifies for the record, that is for turning over the audio and everything. That's right. The defendant is remanded. Judge Kennedy asks, "Who is left?" More female defendants. An attorney for Terry Luke raises an issue. Mr. Luke needs to attend a conference. DDA Chon asks that all out of custody defendants not travel out of the jurisdiction of the court without prior approval of the court. Judge Kennedy responds, "Usually, that's a condition of bail. ... I don't know what your [defense] bond company ... may have conditions of bond." DDA Mathai tells the court that this was brought up about leaving the jurisdiction. Back to Ms. Groscost. Mr. Levy states she is going to North Carolina. She will be there during November 3. He's asking for a 977 waiver. Judge Kennedy states that's fine, just get the waiver prepared and have his client sign it. Kelly Park is brought out. She quickly looks over to her family in the gallery and smiled. As Mark Kassabian leans in to speak to her, another woman is brought out. The court asks, "Did you discuss discovery with Ms. Park?" "Yes, your honor," Mr. Kassabian replies. Judge Kennedy asks Park if she waives and agrees to receive discovery from Mr. Gluck. Park agrees. Next hearing for Park is November 3. The other woman who was brought out is Ms. Nelson. Mr. Navarro, public defender and Amy Jacks for Ms. Nelson. There's some discussion about the waiver of discovery if the other counsel comes over. The court tells counsel, "This building is going to be evacuated in [zero?] minutes. ... You can come back this afternoon or come back another day and have a bail motion." Ms. Jacks states she will come back at 1:30 pm. For all intents and purposes, the building is in evacuation mode. Another defendant is quickly brought out. It's Leticia Lemus. She has dark hair with hints of blond throughout. Tony Brooklier is her counsel. Lemus and Brooklier agree to the new discovery release. And that's it. The bailiff's ask everyone to leave the courtroom. I decide not to stay in downtown for the afternoon session. The next hearing is November 3. Note: T&T readers should know that I am scheduled for jury duty the week of November 2 at the Van Nuys Courthouse. If I don't get called in on November 3, I'll attend the hearing. I arrive on the 9th floor after 8:30 am, which is a bit late for me. I see one of the members of the defense team in the hallway. It's a tall, slender older gentleman who might be one of the private investigators. DDA Marguerite Rizzo is already in the well. With her is one of the wonderful ladies from the DA's victim impact team. I know her. She attended quite a bit of the Cameron Brown trial. A few minutes after I arrive, People Magazine reporter Christine Pelisek arrives. There are no family members in the gallery today. There are other attorneys in the well so it's a good bet there will be another cases on calendar today. Christine and I chat for a few minutes. The court reporter is at her desk. Judge Kennedy's clerk is also here. More attorneys arrive for maybe another case. DDA Beth Silverman arrives and says hello to myself and Christine. The Franklin defense team arrives. Well, Louisa Pensanti was here a bit earlier, but Seymour Amster, Kristin Gozawa and the PI looking man arrive. Amster starts to sit at the defense table and the bailiff tells him, "We have something before you." So, there will be another case ahead of Franklin. DDA's Silverman and Rizzo are deep in conversation. A female defendant in an orange jumpsuit is brought out. I see the court reporter hand DDA Silverman transcripts from September 18 and 24. The female defendant has mid arm length dark hair. She appears to be quite young. Judge Kennedy takes bench, and the case is called. This is a quick appearance. The matter is being put over to December 7. The defendant waives time and counsel join. That's it. The defendant is put back into custody. I overhear the bailiff's talk about "taking her up," most likely to a higher jail floor. If you are ever in the downtown criminal court building, you will notice that the public elevators do not have buttons for certain floors. That's because those floors are holding cell floors. Interesting. There is another female defendant brought out, also in an orange jumpsuit. The court goes on the record. The case is on calendar for probation and sentencing. Judge Kennedy states she has read and considered the probation officer's report. The defense waive [arraignment] for judgement. The court states that in light of the plea agreement, there is no probation. The defendant is sentenced to 2 years on the 422 charge and 4 years on the 186.22 charge for a total of six years. The defendant has 1,014 days credit. [ In LA County, defendants get one day credit for each day served.]. This translates to 2,028 days. The defendant is ordered to pay some court costs and restitution costs. There's something about parole revocation. She is ordered to register as a gang offender; she's ordered to submit DNA samples as required by law. The court asks if this is going to end up being a "time served" sentence. I miss the defense attorney's answer. The court tells the defendant she could be returned to prison up to one year if she violates parole. Every time I sit in court and listen in on the proceedings, I read the penal code for the specific charges and learn something new. The defense attorney tells the court that the defendant has a federal case pending, so it looks like she will eventually be "transferred to another penal institution." And that's if for this defendant. She's taken back into custody. Judge Kennedy asks if the parties are ready on Franklin. Mr. Amster asks the court if they were waiting on him. Judge Kennedy answers that they were. The court reporter passes out copies of the prior hearings transcripts to the defense. The court goes on the record with People v. Franklin. Each defense counsel states their appearance. Louisa Pensati, Kristen Gozawa, Seymour Amster. DDA Marguerite Rizzo states her appearance and also mentions DDA Beth Silverman. The court asks, "Where do we stand in terms of anything." Mr. Amster addresses the court first. "I have two motions I would like to litigate and file today." Amster mentions a notice of supplemental aggravation and a motion for discovery as requested by the DA. I believe it's Amster who states he would like to do those motions sooner rather than later. Then DDA Sliverman speaks. "In order to litigate the [third party culpability motion] on November 2, we've come up against a road block. ...defense has ordered his witnesses not to speak to [us]. ... That would be like [the people] telling the LAPD or me not to cooperate. ...that you're not to speak to the defense counsel. ... not to [cooperate]." Amster flatly denies the accusation. "That's not what I instructed Sorenson." Amster goes on to say that he told the DNA testing lab that he would appreciate if they receive any request from the prosecution, that it goes through defense counsel. I believe the defense adds that it would mean the prosecution would have to speak to the defense if they want to speak to one of the defense witnesses. DDA Silverman tells the court, "They are independent witnesses, that belong to the court system. ... So it doesn’t look like we may be ready on that." Amster counters, "We are asking Sorenson ... they are an independent agents. ... Our preferred method is, if they [prosecution] want communication with them [Sorenson] we would like to be present and have it tape recorded." DDA Silverman tells the court, "That's now what the email states." DDA Silverman goes onto explain that she has a copy of the email that was sent to her from Sorenson. She reads the email quickly. I can't capture everything it states. DDA Silverman states she will file the email with the court. DDA Rizzo tells the court, "There is nothing in case law... Mr. Amster doesn't have the right to direct Sorenson if [the prosecution] wants to speak to them... that the defense has to be present and the interview tape recorded." Judge Kennedy confirms there is nothing in case law to support Mr. Amster's "request" to Sorenson. Amster argues with the court as to the law and requests the DDA file a motion and the court will rule on it. DDA Silverman argues that they are not required to file requests just to speak to a witness. DDA Rizzo tells the court that there were no motions filed when the defense investigators went to speak to the prosecution's witnesses. DDA Rizzo continues arguing the specific points of law. Amster insists, "All we have done is advise Sorenson of our position." DDA Silverman states, "They [Sorenson] are not lawyers and they have decided they will comply [with the defense request]." Judge Kennedy says, "Mr. Amster you are way out of bounds here." Amster insists they are firm in their position. Amster feels that this is not part of what case law is and that the court needs to make a ruling. Amster adds, "There are many reasons why we should do that. ... I think we should be able to know what our witnesses say." The court responds, "You would be entitled to have those statements. You are not precluded to set the contact or preclude contact. ... Any witness of their own volition ... any witness can elect not to talk." Amster restates what he believes is his position and what happened. "So the court is clear ... I never gave Sorenson an order, nor did I direct them. .. [I just said] ... this is what we request that they consider doing." As Amster addresses the court, his voice gets louder and the tone is firm. DDA Silverman gets up from her seat and takes a paper [I believe a copy of the email] over to the court clerk to hand to Judge Kennedy. Judge Kennedy orders, "Turn down your volume Mr. Amster." Amster continues to demand that the issue be briefed, in formal court papers. I believe Amster goes on to state that the court is "outside of it's authority" to make such an order, but I'm not sure if this is a new point he is referring to. Amster then makes an accusation. "...that this court has chosen, ... has given the prosecution wide latitude to not do written motions." Now everyone is yelling at once, denying Amster's accusations. Judge Kennedy tries to rein in the room. "Mr. Amster, I'm tired of you yelling at me. ... I don't need that type of decorum." Amster counters that he's repeatedly requested things be put on the record. Judge Kennedy answers back, "There is everything on the record." Amster continues with his request of the court, to follow procedures and make the prosecution file a motion about the Sorenson issue, so that the court "has the ability to look at all the full facts." DDA Silverman interjects. "I need to put something on the record for appellate purposes. Counsel has accused [the prosecution] of things." DDA Silverman continues with her record of the defense accusing parties of not putting everything on the record. I can't type fast enough to keep up with Beth. Beth continues, "The people have filed all the necessary motions that were appropriate. We don't need to file a motion for every single thing to prepare on our case." DDA Silverman then cites case law. Amster then clarifies his point. "I am not saying that anything has happened off the record. ... I'm saying it's the prosecution tactic to keep things off the record. ... I did not initiate the contact with Sorenson. ... Sorenson called me and asked what our position was. ... We believe everything should be recorded and there should be a record on everything. ... If there is a contact with the prosecution with Sorenson, I believe we should be there and it should be recorded." Amster goes on with his argument. I can't keep up. Amster finishes by saying, "I'm asking the court to have them to file a motion." Judge Kennedy replies, "Mr. Amster, I've not so much as sneezed off the record with this case. ... Every single [working?] motion, contact, has been on the [record]. ... I'd never do anything off the record on this case or any death penalty... in this case. ... The fact that you would intimidate that I'd do anything off the record is ..."[I miss the court's closing words]. Amster backtracks and tells the court, "It's not the court. It is the style of the prosecution ... [that] chooses to litigate off the record." Judge Kennedy stands firm. "Enough. I don't want to hear any [more?]. ... They [prosecution] don't have to file a motion to get a witness to talk to them. ... When you send this type of email ... and you call it a request ... If the Sorenson [staff?] don't want to talk to the people [that's a different issue?]... You don't have the right to set the terms of the contact. ... You don't have the right to set the terms of that and I'm not going to have a motion about that." Judge Kennedy then addresses the prosecution. "If the people [at Sorenson? ], if they decided that they are not going to talk to you, I don't have the authority to [order them] to talk to you." DDA Silverman responds, "We're going to have to bring them into court, and it's going to be at the defense expense." Judge Kennedy replies, "It's not at his [defense] expense. It's at the county." Now it's a back and forth battle for which day next week, to litigate the motions that Amster is going to file today. Understand, Amster hasn't even taken the motions over to the court clerk yet. Amster then mentions something to the effect that he's concerned about starting a trial. I wonder, if Mr. Amster is talking about this trial or starting another trial. I thought his calendar was cleared for this case. Judge Kennedy asks her clerk what day is good for the court. Amster asks the court about a date from the prosecution. DDA Silverman responds, "Assuming that he's going to file his motion." The court replies that the people get 10 days to respond. Amster appears upset about the court's response that the prosecution gets 10 days. He wants to put something on the record. He brings up a past instance where he was only given three days to respond to a prosecution motion. The court tells Mr. Amster, "If they were able to read those motions, they might be able to do it earlier. But how can they know if they haven't even read the motions?" After a bit of back and forth as to who was available when, October 29th is finally agreed upon by all parties. The court orders the defendant remanded, but they don't appear to be finished yet. Amster states he is going to file the motions right now. DDA Silverman tells the court she believes there were records subpoenaed to the court. She asks that they be released. Amster addresses the court about his position on records, and that in the future, when records come in, he requests that the people sign a stipulation. I don't think there's any argument about that. The defendant is finally taken back into custody. Basically, it was a whole lot of arguing from everyone [court, prosecution, defense] about who said what, what they actually meant and what one side is allegedly trying to do to the other. After Judge Kennedy left the bench, the prosecution stays to go over subpoenaed documents to ensure they've copied everything that has come in. As he leaves, Mr. Amster has an unusual conversation with Judge Kennedy's bailiff, but it appears the bailiff is just listening and not engaging him. Cameron Brown on 9/18 at his sentencing. 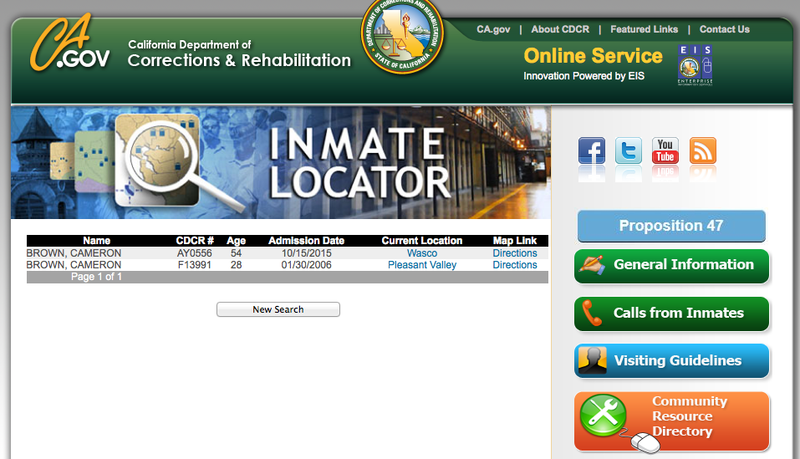 UPDATE 10/16 10 PMCameron Brown is officially listed in the California Department of Corrections and Rehabilitation (CDCR) website. His inmate number is AY0556. 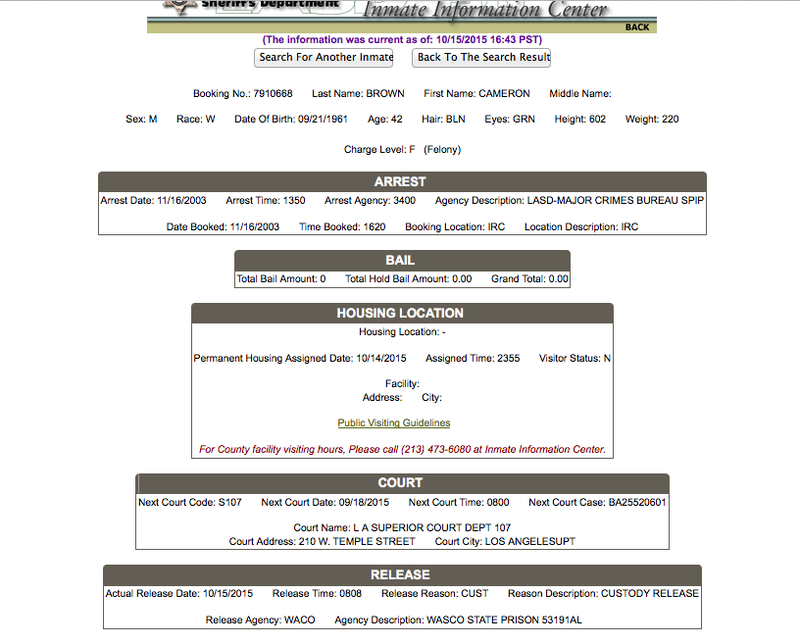 Below is a screenshot of the CDCR's list of inmates named Cameron Brown. Early this morning, I checked the LA County Sheriff's website and it showed that Cameron Brown was still in the county's custody. I just checked the website a few minutes ago and Brown's status has changed. Brown was convicted on May 13 of first degree murder in the death of his 4 year old biological child, Lauren Sarene Key. The jury also found true the special circumstances of lying in wait and murder for financial gain. After the verdict was read, Brown proclaimed "I'm innocent." 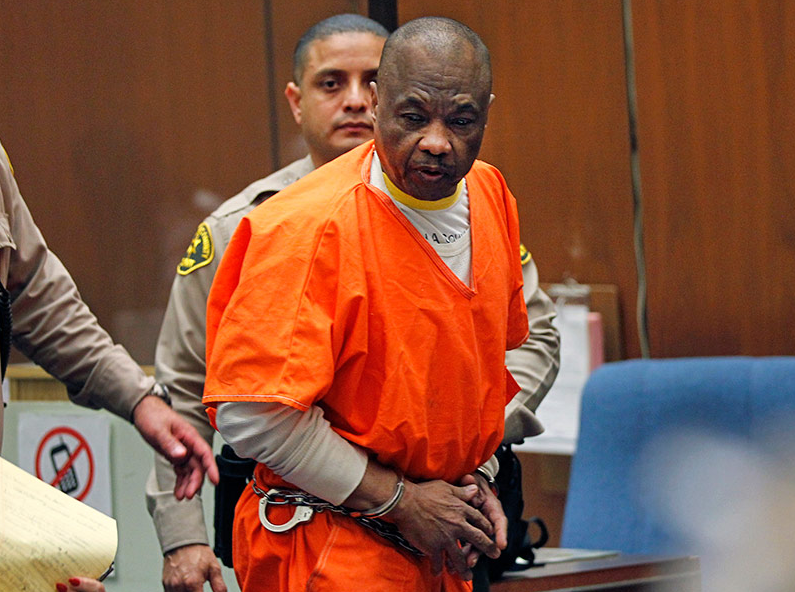 Brown was sentenced on September 18 to life without the possibility of parole. 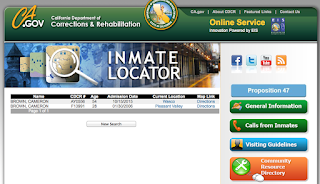 The LA County Sheriff's website shows that at 8:00 am this morning, Brown was transferred into the custody of California's Department of Corrections & Rehabilitation. In the box titled "Release" you can see the time Brown was transferred and that his initial destination is WASCO State Prison, in Kern County, California. I say initial destination because Brown will go through an evaluation process to determine the best housing situation for him. He may eventually end up in a special housing unit because of the nature of his crime. The Los Angeles City Council unanimously agreed Wednesday to pay $2.5 million to settle a lawsuit with the children of a woman who was kicked in the crotch by an LAPD police officer and later died, resulting in a criminal conviction for the officer. LAPD Officer Mary O'Callaghan was found guilty of assault under color of authority on June 5. She was sentenced on July 23, 2015. I attended the sentencing hearing. Judge Sam Ohta denied a probation recommendation from the DA's Office. O'Callaghan was sentenced to three years with 20 months suspended. Because of AB109 realignment, the remainder of O'Callaghan's sentence was served in LA County jail. "I never had the opportunity to say I'm sorry. ... I didn't have the opportunity until now. ... Mother to mother, I'm extremely sorry for the loss of your daughter." O'Callaghan starts to break down, and then continues. "There's not a day [that?] goes by that I don't think of her. I pray for her every day... I pray for her children ... that her children and you and other family members, and how much [she?] loved and [to tell them? please?] forgive her. .... I'm sorry." After O'Callaghan's apology, Mrs. Thomas reached out her arms to Mary and asked the court if she could hug her. I arrive on the 9th floor around 8:35 am. Mr. Sprocket drove me downtown. LAPD Detective Daryn Dupree is here already, deep in conversation on his cell phone. Defense attorney Kristen Gozawa and another gentleman enter Dept. 109 as the bailiff unlocks the door at few minutes later. Ms. Gozawa exits the courtroom and waits in the hallway. Assistant Head Deputy Major Crimes, Craig Hum and DDA Marguerite Rizzo are chatting in the center of the hallway. When Ms. Gozawa sees that DDA Hum leaves, she approaches DDA Rizzo and they have a chat. Louisa Pensanti arrives and heads to the ladies restroom. A bailiff brings clothes down from the security station. They are for a defendant in trial in Dept. 102, Judge Marcus' courtroom. A suited man comes out of Dept. 109 and talks to a casually dressed man and says, “They’re all in there." DDA Beth Silverman arrives. Beth speaks to Ms. Gozawa about evidence that needs to be turend over. Judge Kennedy is in the middle of a hearing in another case. I listen to Judge Kennedy rule on the other case. Two defendants. One defendant is being supervised by a federal agency, the other defendant is out on bail. People Magazine reporter Christine Pelesik arrives. Franklin is brought out. Louisa Pensanti and Kristen Gozawa are here. Mr. Amster is a no show. Judge Kennedy is notified that her court reporter is not here. Everyone laughs. The court reporter comes out right away and the court goes on the record. Parties state their appearances. DDA Silverman tells the court they received a set of SDT documents. The people took those documents, copied them, made copies for the defense and returned the originals to the clerk today. There was one envelope that had not been discussed in court, but handed to Amster [at the last hearing?]. Both DDA Rizzo and Amster initialed [Wednesday] on the back and made copies and returned them to the court. Judge Kennedy states there was a third envelope. It was made known and the third envelope was handled under the proper procedure. DDA Silverman tells the court that she spoke with Ms. Gozawa. She has assisted us in getting discovery and getting various things accomplished. There are various things that have been sent to Sorenson that have not been returned, but will be sent back by next Tuesday. DDA Silverman continues, "One of the investigators for the defense took some notes. They were provided to us. We've looked through them. ... A small amount is decipherable, the rest is not. We're asking if someone could go through with Ms. [Ware? ], to go through, so someone could go through it to see what it says. ... Counsel [Amster?] said he's not required to do that. ..."
The whole purpose of discovery law is so that everyone shows up to court, so that everyone knows what's being said. A copy of the document in question is given to the court. .
DDA Silverman continues, "We’re just asking that someone assist us in trying to decipher these notes." Judge Kennedy comments, "I'm just looking through this, and it probably makes sense to the person who took the notes, but there are things circled and crossed out. It’s difficult to understand what it is. Maybe you’d prefer to have the inviestigator call the DA and talk to them on the phone." Ms. Gozawa doesn’t have the authority to do that [have the DA talk to the investigator directly]. DDA Silverman adds, "The court can make a ruling." The court replies, "I don’t have the investigator here to order him to call you. ... I don’t think the prosecutor has to sit down and inteview this person and recored it. ... These notes are indecipherable. What Ms. Silverman's saying is correct." There is discussion that it would be about a five minute phone call. The court asks, "Ms. Pensanti, do you have the authority to say, have this investigator to call ...?" For the first time ever, I hear Ms. Pensanti interact with the court proceedings. Pensanti tells the court, "Yes." She has spoken to Mr. Amster, yes. I believe it's DDA Silverman who brings to the attention of the court, that the investigator, Mr. Ware, had an interview with the defendant. " ... and if there was such an interview, if any of that interview has been relied upon with other witnesses, we are also entitled to that." Judge Kennedy replies, "I think that is also something for another day." Now they are trying to set a date for Mr. Sours to come to court. Mr. Sours is not available on the October 20 date. DDA Rizzo tells the court that Dr. Sours will be available at a future date of November 2. DDA Rizzo checked with Ms. Gozawa, and November 3 is also available in the event we need a portion of his testimony extended into another date. DDA Rizzo adds that there is another witness that she hasn't been able to confirm on November 2. DDA Rizzo states she thinks they can set the date for Mr. Sours and the second witness for November 2. If that other witness is not available on November 2, then they can set another date close in time or set another date to come back. Judge Kennedy asks, "Anything else?" DDA Silverman replies, "It would be wise to set a date between now and November 2 on discovery." The new date to return is October 13, at 8:30 am. And that’s it. I'm on the 9th floor of the downtown Criminal Justice Center. Kelly Soo Park’s mother and aunt arrive and sit on the bench directly across the hall from me. There are a few jurors and people from the general public who are walking the entire hallway, back and forth, just like they were yesterday. Paul Turley's counsel, Ariel Neuman is already here. We exchange smiles. More of Parks family and supporters show up. I believe the tall man wearing a suit jacket and jeans is Tom Chronister. At the September 25 hearing, I confused him with another gentleman who looked quite similar to him. Maybe he was a relative of Tom's. Mark Kassabian arrives and chats with Tom Chronister. Chronister appears to be reading a document. Two tall slender ladies, part of Parks entourage arrive. They were both here on September 25. I’ve been told one of them, Deborah von Cheave, used to work for Dr. Uwaydah. Chronister and Kassabian take a bench seat in the hall. Ariel Neuman’s co-counsel, Benjamin Gluck arrives. Kelly’s sister Kim arrives. She’s dressed very casually and looks like she might be tired. A totally different look from the two ladies in heels. More people supporting Park arrive. Hugs and laughter are exchanged. One woman goes over to hug Park’s aunt and mother. The courtroom opens and people file inside. Jane Robison from the DA’s office arrives. The Park supporters here today appear to be fewer than what came every day to her murder trial. DDA Mathai chats with Gluck and Newman. Mathai turns and shakes Kassabian’s hand. DDA Mathai then leaves the courtroom and a woman seated in the gallery follows him into the ante chamber for a private chat. We wait. There are no cameras in the gallery today. I note that I’ve never seen Judge Kennedy’s current bailiff crack a smile. He’s all serious business, keeping the gallery free of visible cell phones. DDA Catherine Chon arrives. There are a couple more DDA’s in the well that might be working on the case along with DDA Chon and Mathai. Now DDA Chon and Mark Kassabian at at the clerks desk. A black family enters with a small child and a woman using a walker with a seat. Now, another defense attorney, who I’ve often seen at other hearings arrives. Since I'm pretty sure this defense attorney is not assigned to this case, it's a good bet there is case on calendar involving this other family. Bail bondsman Josh Herman is here. A man who looks like he could be related to Tom Chronister arrives. This is the man who I thought was Tom on September 25. Counsel for the other case checks in with the clerk. A DDA in the other case arrives and also checks in with the clerk. Things are very busy in the well and slightly noisy in the gallery. The defense attorney in the other case stops by to speak to the woman seated beside me. More people arrive to support Park, and also the other case. A man who was seated in the back row joins the other counsel in the well. In the bench seats in front of me, the very young, adorable little girl is talking to her mother. You can hear her high pitched voice echo in the courtroom. Another black woman enters with a child, a young boy, a bit older than the young girl. The children wave to each other. Judge Kennedy's clerk asks, is everyone here for Park? Kassabian comes out from the custody area. Park is brought out. She is now in jail blues. At the September 25 hearing, I overheard talk that all the women were put on a high security floor at the women's jail. That might have accounted for the orange jumpsuit. Now Park's status has changed to a lower security at the jail since she's in a blue jumpsuit. Park's family smiles at her. Also smiling, Park turns back to look at her family several times. The court reporter comes out along with Judge Kennedy. Judge Kennedy greets the room. “Morning,” she states. “Allegations related to Park’s alleged forgeries and fraudulent billing. ... all came back to more than six years ago. ... As you know your honor, Ms. Park was accused of murder. ... Since that time she had no involvement with Dr. Uwaydah’s business. .. [It?] all led up to this involvement ... She’s had no involvement, ... nothing in the transcript of the affidavits. ... So to give credence to an argument that her participation ... before [trial?] is a leap of [thought?]. Kassabian continues to argue for his client. “... Since the acquittal, Ms. Park has had death threats, perhaps not arising to a [terrorist] level, [statements made? online?] ... she should be shot in the head; she should be dropped off the Santa Monica pier. ... A group of the victim's [Juliana Redding] friends, came and asked the DA's office to have some satisfaction ... they were asked to leave. ... [They replied/stated?] ... Oh, we know where she lives and can take care of this themselves." Judge Kennedy replies, "The acquittal was years ago." Kassabian continues with his argument. "If they [Park and her husband] see something that looks unusual, Park will hide." Kassabian brings up her prior performance on bail. He mentions the "elephant in the room." "Ms. Park was out on bond in a serious murder case where she was facing life without parole. ... Every day for every hearing she was here on time. She did not flee. She did not run away." Judge Kennedy responds, "She did have three million reasons not to run." Kassabian replies, "She did. And I remember, she did not run away." Judge Kennedy agrees, "She did not." Kassabian presses forward. "The day before the verdict, there were notes that came out of the jury room. I tried to be optimistic [but these notes] suggested strongly they were going to come back guilty. ... The next day, she was sitting where I was standing. She didn't flee then. ... And the jury, getting ready to announce the verdict ... knowing she was going through that door and all likelihood, she wasn't getting back out ... in circumstances that are much more dire than she [is facing?] here." "Given that prior performance on bail, ... we are asking for now is perfectly reasonable. ... It will ensure her attendance in court. ... It will [?] ... safety to the community issue. ... The bail is excessive. A tenth of that is excessive." DDA Dayan Mathai steps up to counter for the people. "Framing for the court and counsel, that this hearing that we're doing ... the parameters set forth in the [law for bail] are very clear. ... Counsel is arguing something that the language of the statute really prohibits. ... In [penal code] 1275c, for purposes of this subdivision, unusual circumstances does not include all prior court appearances. ... As you know, this is a case where the bail schedule has dictated what the bail amount is. ... The bail that is set for Ms. Park is actually lower than the presumptive bail requires. ... We've decided to stick with it. ... The bail is already set below the bail schedule." "I've pointed that out in our initial opposition. ... What the court must be concerned with, according to the statute here, ... public safety and the flight risk of the defendant." DDA Mathai continues to detail the facts of the conspiracy, as revealed in the grand jury transcripts. "This fact ... is a very complex, elaborate scheme, and various components in a conspiracy. ... Ms. Park is at the heart of the conspiracy. ... She was not [a tangential?] player. She was a principal with Dr. Uwaydah. ... She was essential. One of his trusted advisers. ... And what the evidence will show in the case, [she? [ had various keys and they were all centered around making money [schemes]. ... The money was made at all costs. "The health of the patients in the clinics, that he runs and that Ms. Park was running ... the health of these patients wasn't even secondary. It was of no concern. ... The collaborators conducted schemes to maximize their profits and the health of the patients was of no concern. ... As his trusted adviser, the evidence in the grand jury shows she was given great authority ... in the clinics she was present at the surgery center and she attended meetings with Dr. Uwaydah where they discussed .... while surgeries were going on in another room by someone who was not trained." "And the rationale, to justify in their own mind this criminal behavior that was occurring when she was [?] down the hall with [Uwaydah?] ... So what we have here is [criminal? conduct?] that is not the form, to justify the change [to reduce bail]." "There is an enormous amount of evidence that Ms. Park was in a role ... there is an important part of the conspiracy that has to do with obfuscating and hiding the criminal conduct. ... That really is an important part of what Kelly Park played. ... background on the surgeries that were at the center ... the aggravated mayhem charges. ... Dr. Uwaydah had surgery privileges going back to 2005 all over southern California. ... And he traveled all over, and did so with his surgery assistant." "Dr. Uwaydah got in trouble in one of those hospitals. It was serious trouble. He and Peter Nelson received letters from the chief of staff from Tustin Hospital, .... having Nelson perform surgery while he was not in the room, was totally prohibited. ... But the California Medical Board, the regulatory agency that oversaw the medical profession, opened an investigation that happened at Tustin Hospital, where Nelson was in trouble for conducting surgical procedures." "Dr. Uwaydah had a pattern in all his schemes, ... that controlled the health care [of his patients]. ... Shell companies, transportation services for patients. ... That's part of these larger conspiracies. Her name was on some of these companies and bank accounts. ... When he got in trouble, he decided to open his own surgery center. By doing that, he took out any level of overseer that would have prohibited stopping ... of this criminal behavior." "The medical board still continued to investigate. ... We have evidence that Park was involved ... What the allegation suggests was an attempt to distract and impede the California Medical Board investigation. .. All the while the medical board was investigating, this criminal investigation ... there were hearings and affidavits from Tustin Hospital [staff]. ... One of those witnesses was a doctor in Orange County, named Dr. Cosme ... A lot of this was happening in 2009, when Park was deeply involved with Uwaydah and his practice. ... We have recovered evidence that Park was investigating witnesses, who were going to testify against Uwaydah. ... In her computer we have basically an entire dossier on Dr. Cosme, and where he lived, his social security number, his home address. ... In her computer, in her house, she had the surgical nurses personal information. ... She hired a PI [private investigator] to do background checks on these medical staff. ... In her journal, we have her writing notes about getting information on these witnesses. That's scary stuff." "Just before Dr. Cosme was supposed to testify, and let the court know what happened ... and I'm not saying that we have all the answers to this fit it is a fact that Dr. Cosme was shot at. He was walking through his neighborhood and he was shot [at?]. That's fact. ... Kelly Park's materials ...is information not only on Dr. Cosme but other nurses." "In her computer we have correspondence with Ron Case, her ex-boyfriend, where she is giving him information about some of these witnesses. ... And what we believe ... we've shown in the grand jury, that in an email that is a big email ... was created on her computer about one of these witnesses. [It was a fake email.] ... The substance of the email given to Ron Case ... to put it in an email to make it show it came from one witness to another witness. ... It was an attempt to create false information, to make it appear like it came from another witness. 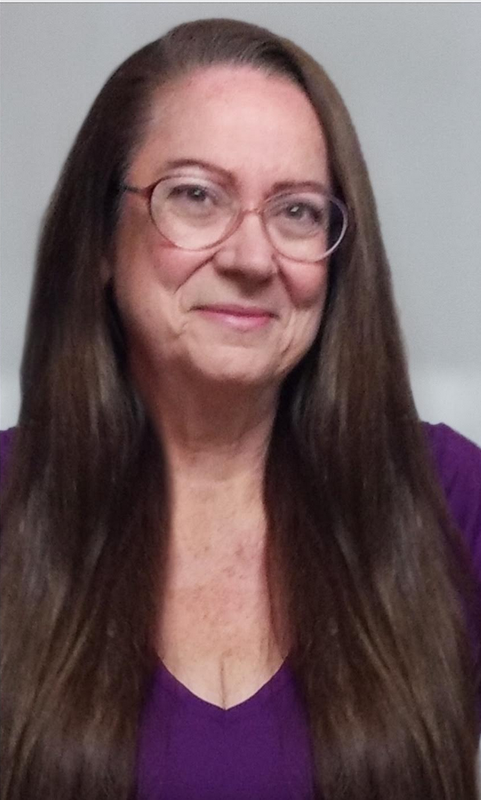 ... What is scary about that your honor, information was received from a PI, that Park paid for, to get this information ..."
"One of the main victims in this case, Jennifer Malone, ... she received a surgery and it's in our charging document, where gauze was left in her arm, four to six weeks. Two feet of gauze. She finally got an x-ray, and it was removed without any anesthesia by Nelson at [Uwaydah's ? hospital?]. Jennifer Malone filed a lawsuit. ... We know from witnesses in the grand jury and ... other co-conspirators, they had a term for creating false documents to get what they want and that term was moorparking." "When we learned of this evidence that they were fraudulently creating document ... if you look at Park's journal, you'll see the term 'moorparking' in relation to Jennifer Malone. ... You'll see the term moorparking." Looking over at Park, she appears to be slightly shaking her head 'no,' while DDA Mathai talks about the falsification of documents. "She was connected to preventing this criminal activity coming to light. She is a co-conspirator [with] Uwaydah and Nelson. ... Any authority that did look into it ... she was involved in hiding it from the medical board and the courts. ... Fast forward to June 2010. ... Kelly Park was arrested on June 16, 2010. ... There was surveillance going on with Ronnie Case on a street in Camarillo. ... for this court's consideration of public safety and flight risk. ... We know she was arrested and told ... law enforcement wanted to get a swabbing of her fingerprints. ... She made a phone call from the jail. She called Ronnie Case and she told him that, 'I got arrested; they are getting my fingerprints' ... and she was getting rid of [this?] and coming home." "The focus of time in that moment of when she came home, Ronnie Case was busy. He loaded up the truck. It was loaded up with a thousand prescription bottles of actual prescribed medication. ... It's all part and parcel of this elaborate scheme that Uwaydah had. ... And she [was] intricately involved with Golden State Pharmacy, which was his [Uwaydah's] pharmacy. ... She and her sister Kim were involved in the perpetration of the fraud of the pharmacy. ... He packed that [truck up] after the phone call, that she was arrested. ... He packed a laptop, thumb drives, and in Ronnie Case's pocket, was his barrel of a gun that was sawed, cut lengthwise, which experts, or anyone familiar with guns, by cutting it lengthwise, it obscures any testing on the gun." "So the concerns in this case your honor, the point I'm making in this court, they do involve the very core of what the court should consider, flight risk. ... Counsel is saying he doesn't contend that she was hiding herself in the car, but taken together, she emailed at least one co-conspirator at the time she knows arrests were happening. ... If Ron Case was clueless as to the meaning of this email, she emailed him to warn him that he could get arrested. ... What's the significance of that? She doesn't know he has an arrest warrant. But she knows a co-conspirator, she knows she's engaged. She's warning him. The fact that he didn't act on it .... She warned him about the arrest when she sees several investigators outside her house." DDA Mathai brings up more points to consider. "... is that Kelly Park does present a flight risk by her actions. They do represent a risk to public safety by the allegations in this case. ... I know the court has taken all these matters seriously and we've had several [defendant's?] in court on this case, and the court has reduced some [bail]. We ask the court not to reduce the bail, and have her have that bail in her case. DDA Mathai continues, but there are counsel for the other case in the gallery who are moving around, speaking to family members and I am having trouble hearing. "She had her name on several bank accounts ... that are part of the transcripts in this case and part of our argument. [We] ask the court not to reduce any" further ... not less than 15 million dollars. Kassabian gets up to counter the people's argument. "The DA has made serious arguments that will be very interesting at trial, and we are prepared to deal in the merits of the case. ... but no indication for the last six years. ... Ms Park has nothing to do with Mr. Uwaydah's business and no evidence that her involvement in forgery ... [She constituted?] no risk to the public on her release." Kassabian talks more about the PI, and that she claims that she was working for. "If that's an indication of the threat to the community, then all the attorneys who have conducted ... contacted PI's ..."
Judge Kennedy interjects, "Attorneys, [yes], ... but an office manager? It's a little unseemly." Kassabian counter's the courts response. "In my experience, people will do things on their own ... and it was done through a PI and they are in that business. ... Does that suggest from six years ago a doctor she doesn't work for anymore ... does that mean a risk now? The answer is no. ... We are prepared to deal with the merits of this case. ... Is she a flight risk? No. ... What we are here for is bail and not to try the case. ... If she is released on bail she will attend every hearing in this case. ... What the DA has presented is the case. ... What is lacking is the why and why she is a threat to the community now."" Kassabian states something to the effect of the likelihood of Parks appearance, then adds, "The current bail is unreasonable and excessive. A fraction of the bail is excessive." Judge Kennedy rules. "I think taking into account the public safety, ... reduce bail to 10 million and 1275 remains in effect." Kassabian informs the court that the LA County Sheriff's no longer have the women in "K-10" [a high security floor at the women's detention center], but there is some sort of separation order, keeping Park in solitary confinement, and they [her counsel?] don't kow about that." Judge Kennedy answers, "I had my bailiff look into this." Judge Kennedy's bailiff responds, "Because this case is notorious; newsworthy." Judge Kennedy adds, "I leave classification [of detainees] up to the Sheriff. I don't tell him where he needs to house defendants, and he doesn't tell me how to run my courtroom. ...I know that when we made the inquiry last time, a couple of the defendants were changed from K-10 to K6. ... I don't know if she's notorious ... [other?] than the prior case. I don't know. ... But unless you want to talk to someone there, ... I don't have a problem ... sheriff houses her in where they think is appropriate. ... You're saying she gets threats ... maybe some of the other inmates have threatened her. ... And you brought up other threats ... she has other enemies, and what people are upset about ... what happened at her murder trial ... and maybe there are people in the jail ... I don't know. And if you find out information, we can take up the issue again on the fifteenth [10/15]." Kassabian tells the court that Ms. Park needs specific medication that she was prescribed by her doctor. He has a letter from her doctor. She tells Kassabian that she will sign a medical order. "I will order that they examine her. ... And if you want to communicate that she was prescribed medication, but I don't tell a doctor what medication [to prescribe]." Kassabian tells the court that he has a letter from her doctor and should he give it to his client. The court tells him to give it to the bailiff, and to fill out a medical order and she will sign it. Kassabian thanks the court. When Park gets up from her seat to be taken back into custody, she turns around and smiles at her family. Kassabian then addresses the court on David Johnson. He is asking to advance Johnson's scheduled court date from October 7 to October 14. He is standing in for Johnson's counsel. The next issue is medical records from Men's Central Jail. There was a prior agreement that Ms. Chon would take custody. Benjamin Gluck and Ariel Neuman, are next to be heard. They are following up on the grand jury transcripts and the grand jury instructions. DDA Chon has an update to the court. She sent out a mass update. Judge Brandlin changed the procedure regarding the grand jury exhibits. That has been resolved. The exhibits are in the grand jury room and the defense has access. Judge Kennedy asks, "Does that mean they can go in and copy them?" DDA Chon confirms, "They can go in and make copies of them." Mr. Neuman tells the court, "Then that leaves three questions." I believe he's asking where the exhibits are, physically. DDA Chon answers where ever the clerk's exhibit room is. Now Mr. Neuman is asking about the grand jury instructions, and getting a physical copy of those. DDA Chon answers regarding the instructions, that Judge Brandlin did sign the order with instructions. The court reporter is preparing [a list?]. DDA Chon believes there were two court reporters and as soon as those instructions are ready, they will contact the defense. Mr. Neuman asks where the exhibits have been, all this time. "Just because of this snafu, we need to know where they've been." Judge Kennedy tells him, "You will have to investigate." DDA Chon answers, "I believe they were with the grand jury adviser." Judge Kennedy asks, "That is a DA?" DDA Chon replies with the advisers name. Judge Kennedy responds, "I don't know if they were in the DA's office or the grand jury room. You'll need to find out. Neuman is asking more specific questions on the instructions given to the grand jury. He says something that they [the transcripts?] reference instructions on conspiracy law. And the grand jury is told, previously told, received in [? ], and Neuman is trying to find where those are. The people don't seem to know. DDA Chon answers, "They were read the instructions. I don't know what they were provided. And Judge Brandlin doesn't require that the actual instructions be turned over but they were written as part of the order." Judge Kenndy states, "On the Bell matter, this came up. ... There were instructions they received on any case. Then they get instructions on a specific case. ... I don't know if they still do that. ... It may be they get general instructions as they did a couple years ago. ... Then they get the specific instructions that would have been read in connection to this indictment. ... You are interested in both?" Someone surmises that they need to check with the grand jury adviser. There's more discussion about these instructions and whether they need a court order. Neuman is asking for a copy of what the grand jury was given. DDA Chon will look into that and have that resolved by the fifteenth [10/15]. DDA Chon states she will follow up today and email all counsel as to her progress. They are back on the ninth [10/9] for another hearing. Lonnie Franklin Jr, 9: Judge to Defense Attorney "You are looking into my eyes and lying." It's 1:30 pm on the 9th floor. During the morning session, I had attended the Cameron Brown sentencing. I had lunch downtown and waited for the Franklin hearing. The courtroom opens and I head inside. We wait, but not too long. Franklin brought out. On the record now with People v. Franklin. Kristen Gozawa on behalf of the defendant. The prosecution has filed a motion to continue as well a motion to continue motion on 3rd party culpability. State of the record. Mr. Amster for the fist time [wants] to present such evidence in the guilt phase, where additionally, there had been representation by the defense, the evidence related to Chester Turner. There are a number of additional individuals who are listed in the defendants reply to 3rd party culpability evidence. Judge Kennedy asks, "I assume from that, the prosecution was not previously aware of that reply by the defense. ... That the prosecution ..."
DDA Silverman responds. "Prior, he was only going to present evidence to Chester Turner as to two victims. Now we have 20 different suspects as to every single victim." Amster replies, "I don't believe I said that." The court replies, "Oh yes." Amster continues with his denial. "In fact, I never said anything as to what the limits were going to be on the defense. ... Anything at ... in discovery, ... at trial is fluid." I believe the court responds, "We're not even in trial." Amster continues with his 'explanation.' "Yes, but now they are trying to limit ... The things related to these 20 people, they've had it for months. ... They've reviewed it, and ..."
Judge Kennedy interrupts Amster and tells him, "You are looking into my eyes and lying." I've never heard a judge say anything like that before. Amster in his reply, raises his voice to the court and denies he lied. DDA Silverman documents for the record that Amster has raised his voice to the court. Judge Kennedy continues, "You stated to the court, ... I don't have the transcript in front of me, ... you stated to the court only 3rd party culpability evidence in the penalty phase. ... At the last time we were in court ... I don't know what you may have spoken about to each other. ... In court, you have made no mention of these issues. Amster. replies, "One, things change. ... Where I'm having a problem, in guilt phase, is section 190.2c, that talks about every person, not the actual killer, aids, etc., has to be found true, in order to be eligible for special circumstance." Judge Kennedy replies, "I'm not following you." Amster reads the penal code for 190.2 to the court. He then adds, "So we believe there is the burden that the people have, that Franklin is the actual killer. We are going to ask for a special verdict on that point. I think the jury is obligated to find that factually ... so that's why [they] ... now bringing it up at guilt phase because I don't know the courts position ... if that's binding at guilt or penalty phase." The court patiently explains to Amster, "What you have read, essentially is a special circumstance under 190." I believe Amster speaks but I miss his statement. DDA Silverman states, "It's the "aider and abettor" language. ... Apparently the defendant is going to testify that he committed other crimes with other people but he didn't kill them." Amster, responds,"There’s not been a decision whether the defendant will testify or not. ... I believe the people have the burden and not the defense." Amster continues. "We have .... but no evidence. With Washington, we have sufficient evidence if not more if Chester Turner." Amster reads on, about different victims. and that the prosecution has the actual burden. Aiding is and abetting is a theory of liability. It is one the defense can rely on if they wish to do so. Amster states he believes it's a burden. I'm having difficulty following Amster's arguments. Amster is hard to follow. He continues with his soliloquy to the court. "This has been a journey, and to tell you the truth, I didn’t realize how much we had on Chester Turner. And the other one that we have multiple issues on, Alan Thompson." Amster mentions two more names that I don't get typed accurately. Judge Kennedy states, "These are people I’ve never heard of." Amster counters, "These were people that the people [prosecution] knew about." DDA Silverman answers, "They were ruled out by DNA. Looked at and ruled out." Judge Kennedy states, "I read there may be semantics ... there were places where some person couldn't be ruled out. ... or that no one could be ruled out because of incomplete or [?] DNA. So what does that mean?" Amster gives an explanation. " We had all the evidence tested and found unknown alleles from various donors. ... We then looked at that to see ... looked at some of those other individuals." DDA Rizzo [who I understand obtained her masters degree in the biological sciences], counters Mr. Amster's statement. "It's not exactly as counsel has articulated it. The question of items of evidence and the evidence tested. ... One hundred of the items he's relying on, Sorenson will not render an opinion, because they are context mixtures of, of two to six, or of seven to eight people." DDA Rizzo explains that the court has seen these charts of several people mixtures, then adds, "These items that counsel is telling the court, that includes twenty-three parties, one parties, one marker has ten, twelve, fourteen alleles. ... [Allen Tut?] at that marker is a 14, 15. ... At the same marker, it has 12 alleles in it. ... We're going to find the same markers that [Mr. Tut] has. ... [It's a] ... complicated mixture, that no one would touch it. ... Sorenson wouldn't. Our lab wouldn't. You go against all the correct methods of statistical analysis. ... These are the items of evidence that Mr. Amster is calling into question that there's a third party." [I will add a little DNA primer here. Bear with me. Today, scientists look at thirteen or more locations (loci) on the DNA that have what are called, STR's, (short tandem repeats) in the DNA sequence that are highly polymorphic, or, unique to each person. The STR's are expressed as the number of repeats you got from each parent. If the repeats you got at a particular loci are the same number from each parent, it's expressed as a single number, instead of two. For example, at loci one, you might have 11,12. At loci number two, you might have 18. At loci three, you might have a 21,22, and so on for all thirteen loci. Problems arise when you pick up too many numbers at each loci. This means you have a mixture of more than two individuals DNA. When scientists have a DNA mixture of too many alleles, they cannot make any type of predictable analysis on that DNA sample. It's basically garbage. Amster responds, "I think what counsel is arguing goes to the weight, not admissibility. ... This goes to third party culpability and needs to be litigated. ... I have to have Dr. Sours here hready to testify because it's Dr. Sours is the one who's willing to do it." Judge Kennedy replies, "We've said that we need Dr. Sours. Are you saying that Dr. Sours is going to say something different than [what] Ms. Rizzo has said? ... Have you given them something different in writing that's something ... ?" Amster states, "We've given them everything we have from Dr. Sours." Then Amster seems to backtrack a little. "I can’t say I know what Dr. sours is going to state, but it’s somewhere in-between what Ms Rizzo and I have stated." Judge Kennedy states the accepted interpretation regarding 3rd party culpability evidence. "Under Hall, there has to be some kind of nexus between, the victims and 3rd party." Amster continues, "Whatever it is, ... we’ve harvested this evidence and made our position, we feel there’s a different position as to guilt. ... We put Mr. Sours on the stand and the court makes it ruling." Judge Kennedy adds, "Let me inquire ... of this." [It's not clear from my notes who replies, defense or people. ] There's still something that's yet to be tested. There was still a report to be provided on DNA that was late. All testing has been completed and everything turned over. Judge Kennedy, "But you think everything has been turned over and you [people] have to have an expert look at it... Looking at that, [the large stack of paper on the prosecution's table] that’s about a foot of [paper]." DDA Silverman responds 1,759 pages, not including the audio files. That was just since Monday." Judge Kennedy asks, "This is an issue that involves experts? That 1700 pages of evidence turned over on Monday?" DDA Silverman answers, We haven’t even had it for five days. Some came in on Monday; some on Tuesday." The court asks, "When was the last time you got something?" DDA Silverman clarifies, "Yesterday." The people also tell the court that they still have not received anything from defense expert Fuentes. Amster states he’s asked for him [Fuentes] to turn over everything. Judge Kennedy asks the people, "What I want to know is, what period of time is necessary to digest that foot and a half of material turned over this week?" DDA Silverman answers, "I don’t think we will be ready to go to trial this year. We have to meet with experts and then we have to prepare." Judge Kennedy concludes, "What I would like to do, ... when [can] this third party culpability motion, be heard, because it is fairly critical in this case." DDA Silverman states, "We expect to be ready to litigate after the experts have looked at it, a 30 day period, ... after a ..."
Judge Kennedy now addresses the defense. "You’ve put everybody in a box." Amster is firm in his answer. "I don’t agree." Judge Kennedy counters back to the defense. "You’ve turned everything from you experts in volume, days before trial. ... It’s one thing to turn over a police or investigator report, it’s another thing to turn over scientific evidence at the last second. ... The issue seems to me is this. If your position is, that you're not waiving time and you're ready for trial. The remedy of the court has, is two [options]. ... One, is to find good cause. The second is to you’re not waiving time and your ready for trial. ... Then that evidence will not be presented at trial. Amster goes back in time as to his view of what happened regarding getting the DNA evidence, regarding DNA testing. I can’t follow his soliloquy because I’ve not been here for all the hearings. Amster's tone is loud and firm in his answer. "No. We’re not waiving time. We are very comfortable as to where the record. is. This is all evidence that they’ve had for 20 years that they chose not to look out not to test. ... Now the court is considering ..."
DDA Silverman interjects. "For the record. Counsel was still raising his voice and yelling at the court." The court replies, "I want nothing more, than to have a fair trial in this case. .. You have indicated to present this evidence in the guilt phase, and you’ve not made that before. ... But I’m not going to make the prosecution proceed unprepared. ... And they [defense?] indicated and that I assume it’s true, it was all turned over in the last few days. ... And I assume that’s true." Amster insists, "This week. The vast majority. ..." The court tells the parties, "I want everyone to be prepared." Amster responds forcefully, "The people have remedies. ... If the court wants to place that against the defendant in regards to a speedy trial ..."
DDA Silverman makes a record. "Again your honor, counsel is yelling." Amster stands firm on his position. "Let me make it clear. We’re not waiving time. We’re ready for trial." Amster insists that they [the defense? initially?] requested November. Judge Kennedy addresses Amster. "And you have been assuring me all along, getting [their?] experts and everything as quickly an expeditiously as you can, and problems getting the material to you, all of these things, ... and, here it is. ... I assume this is all of it? There’s not going to be anything more? Amster tells the court, "I don’t have anything else now." Judge Kennedy weighs her options. "I’m telling you that, ... the choices involved, ... I am [not] happy not happy ... [not] willing to allow and deal with last minute evidence but, ... so that both sides get a fair trial, ... their experts have to have time to deal with what you’ve proffered at this late date." Amster stays with his interpretation and position. "I'm comfortable with the record. ... I'm not waiving time." DDA Silverman responds for the people. "I’m not going to comment on counsel's comments about the prosecution. .. I think for appellate purposes, I think it's safer for the court to continue the case vs continuing [towards trial]. ... I think the court is seeing that counsel is playing fast and lose." Judge Kennedy rules. "So, I’m going to find good cause. Mr Amster, because in ...[my interest? is not?] the same as your interest. ... My interest is to see that both sides have the opportunity to present their side. ... I do think there’s late cause in this late discovery. ... I don’t know what your expert is specifically going to say. But the issue is critical what the experts say on a third party culpability, on defense. ... And I can't make a ruling without their testimony. ... It changes the scope of the evidence presented. ... First it was going to be only in the penalty phase. ... Then it was only going to be on a couple victims. ... Now it’s on many victims. ... I’m going to continue to give the people time to prepare." Addressing the people, the court asks, "Are your experts available to go through this material? ... So, you say 30 days? ..." DDA Silverman confirms, "Right." The court asks the people to pick a return date. First, the week of October 19 is picked, and the people will verify with their experts. Amster mentions that October 23 is the death penalty seminar. He tells the court if he has to be here on that date, he would rather be at the seminar. Judge Kennedy responds that the court has a date for a seminar for judges, so that just might work out. Then Amster addresses the court on the "lying" comment earlier. "I've been around for a long time. I do not like being called a liar your honor. ... I found that truly, ... truly did not like that." Judge Kennedy stands firm and tells Amster to go back and look at the transcript. "Your representation with regard as to what you were going to present." Amster makes some response that I don't quite catch, something to the effect of telling the court to look at the transcript too. DDA Rizzo informs the court, "It was in the motion we filed two days ago." Back and forth the parties go, trying to pick a return date. First there's October 21. Then the court suggests October 20, but it's not an amicable discussion. DDA Silverman adds for the record, "Again, counsel was yelling at the court. It’s not necessary." October 20th is settled on. They still need to pick a date to return, to see if defense counsel is able to bring in Dr. Sours on October 20. Back and forth it goes again, to pick a return date. Thursday, September 24 is chosen. Apparently, there are not going to argue any motions or turn over more discovery on that date. It's just to let the court and prosecution know, when the defense will bring in Dr. Sours for questioning. Judge Kennedy now steers the conversation as to setting a new trial date. October 14 as a trial date is vacated, because this hearing is going to occur after that date. Judge Kennedy then asks, "I believe, and please correct me if I'm wrong, ... that this is the last major motion. ... I know there will be other 402's [but this is the last?] major motion before trial?" Amster answers "Yes." He adds a bit more that I miss. DDA Silverman responds, "Assuming all the other information not related to DNA [is in?] and that they will be able to give [you? us?] a ready date. ... Not all of this [the 1.5 ft stack of paper at the prosecution's table] is DNA, so we need to check with other individuals as well as their readiness." Judge Kennedy asks, "Can we pick some realistic date?" October 20th is the date. There may be another hearing with respect to defense firearms [expert]. DDA Silverman doesn't think it will be the whole day. Amster is making some complaints related to Dr. [Correll?]. DDA Silverman adds that a huge amount of this information has to go to the ballistics. She adds, "I notified the court two years ago that Mr. [Correll?] was excluded by other courts. And no one was going to get on the stand and claim they are an expert." Judge Kennedy decides, "We'll do it closer to trial. I believe DDA Silverman adds that she subpoenaed multiple documents from the jail, and they would like to see if they are in the court file. Judge Kennedy doesn't know if they are yet. Amster states he did inquire if there were some sealed documents. Judge Kennedy asks if he subpoenaed some documents. DDA Silverman wants to handle the subpoenaed documents now. Judge Kennedy takes the conversation back to the question of when to schedule a trial. They need lead time to get the jurors. The court also asks about the defense witness list. DDA Silverman states, that the people received a list today because of Ms. Gozawa. "She's excellent," DDA Silverman adds. Next, the court goes over the envelopes [subpoenaed documents]. Everyone is in agreement that they can be turned over to the appropriate parties. Judge Kennedy asks again, about a date for trial. DDA Silverman answers, "I hesitate to pick a date at this point. .... [waiting?] will be smarter ... but I think it would be smarter to get to the date in October and then pick a date." Judge Kennedy disagrees. "I would prefer, [to pick a date today?] ... because I'm doing this on good cause. ... I need a date." DDA Silverman answers, "December 15." Amster replies, as a question. "December 15? ... Okay. Any date works for us." Judge Kennedy comments to Amster, "I understand. You have seminars, etc. ... " She then addresses both parties. "If either side changes their position with regard to that date, sooner rather than later when dealing with that issue, and the jury prescreening issues ... the 300 that we need to pick a jury." DDA Silverman adds that if the people's experts look at this and then they come back and they will say they're ready. Judge Kennedy asks if there are any other issues to take up at this time. None. They will come back next week, September 24, to determine the availability of defense expert. The court states they are done and the defendant is remanded. DDA Silverman thanks Judge Kennedy, and that's it. Next court date, September 24.